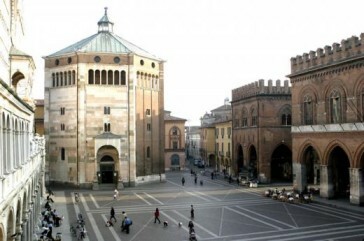 the historic centre, organised around the central piazza and its medieval and Renaissance monuments: the cathedral, the baptistery, the tower and the council buildings. In this lively and hospitable city, where gastronomic pleasures are valued as much as hard work, we can still find the panoramic views and the intellectual stimuli that inspired the music of Claudio Monteverdi, the painting of Sofonisba Anguissola in the late Renaissance, and the many generations of Cremonese lutists. Sport and culture are at home in Cremona, as can be seen in the indoor and outdoor sports facilities, the cinemas, the opera and theatre seasons, and the international character of the concert and dance cycles which are held in the city. Cremona is easy to reach, being directly linked with other cities in Lombardy and the main centres of Piedmont, Emilia Romana and Veneto. In a few hours by train or car, one can reach all the major art cities in Italy (Venice, Florence and Roma) as well as the Alps and the Mediterranean sea. The SMEA postgraduate school is on the Cremona site of the Università Cattolica del S. Cuore. 3 lecture rooms reserved for students of the postgraduate school. Each room has multimedia facilities including intranet and internet. 5 study rooms reserved for students of the postgraduate school (SMEA students). Each student is assigned an area, containing a desk, shelf-space and keys for the safe-keeping of personal items. 14 offices for SMEA teaching staff and researchers. A specialist library with books and journals on management and economics and publications for the food sector, dairy products in particular. From the library computers, as from all computers on site, the library system of the Università Cattolica is available, with on-line publications and data banks. The whole SMEA area has a wireless connection to both intranet and internet and students from the post-graduate school have access to it. Several computers are located n the study areas. By BUS (buy a ticket from the newspaper kiosk before getting on the bus). Outside the station take the number 4 bus, going to CAVATIGOZZI. Get off at the stop in front of the School, about 500 metres after SPERLARI. By taxi. The taxi rank is on the left as you leave the station. The cost is about 6 euros. On foot (about 2 km). Leaving the station turn right and walk along to piazza RISORGIMENTO. Go straight on and along via GHINAGLIA. At the end of this street and over the level crossing you arrive in via MILANO. Continue straight on and on your left you will see SPERLARI. The School is on the left about 500 metres later. For the last few metres there is no pavement. Take a bus to the station (the main interchange) and then take bus number 4. Timetable and route information is available at the website of KM. From the A21 motorway exit CASTELVETRO, follow signs for CREMONA. After the bridge over the Po, turn left at the roundabout onto the ringroad. Take the second exit to Pavia and turn left onto via Milano. Immediately on the left you see SPERLARI. The School is after the next traffic lights on the left, after about 500 metres. From the A21 motorway exit for CREMONA, follow signs for CENTRO CITTA'. At the roundabout turn right onto the ringroad in the direction of PIACENZA. Continue following signs for Piacenza, across a roundabout, two flyovers, and another roundabout. Then take the second exit to PAVIA-CODOGNO. At the end of the road at the traffic lights turn left onto via Milano, (away from the city). The School is on the left, after about 500 metres. At the end of the road "PAULLESE" SS 415 ( Milano-Crema-Cremona), you reach a roundabout. Turn right in the direction of PIACENZA, and take the second exit for PAVIA_CODOGNO. At the end of the road at the traffic lights turn left onto via Milano. The School is on the left, after about 500 metres. At the end of the road SS 234 (Pavia-Cremona) go past CAVATIGOZZI. After 2 km you arrive in CREMONA. The vehicle entrance to the School is straight after the traffic lights on the right.